It’s a good thing I like tea, because I’m living off of it. (Well, that and the cheese danish I just got at Grand Central and the sandwich and the oatmeal…) I think I’ve had four cups today. I just put the kettle on again. I guess that’s not too many, but when I have a cup it’s because oh my God, I need a cup of tea. I haven’t quite reached the ‘I wish I had a teabag in my throat’* stage, but I do frequently feel like I just might die if I don’t get something hot and warm in my throat NOW. *Once uttered during a particularly wretched sore throat phase. The funny thing is that I can’t remember if I said it or if someone else said it…at one point I had three very similar remarks about tea on little scraps of paper taped to my tea cupboard. It might have been Lis, Bee, or me, but it really doesn’t matter because I feel like I experienced it. Me and Lu. I just love this picture. I’m about six and she’s probably two. 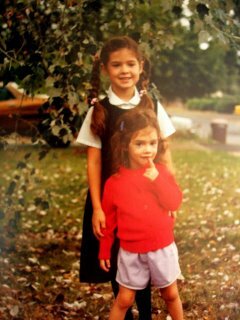 This was the front yard of our first house when we moved from Indiana, before we rented the house across the street, where my brother was born, and before we bought the house down the street, where my parents still live. That tree behind us is gone now, and Lucy is taller than me. I’ve been reading An American Plague: The True and Terrifying Story of the Yellow Fever Epidemic of 1793. And coughing. A lot. The two seem tied together somehow. But besides making me sick, it’s a great book. GREAT. I’m serious. I’m learning all sorts of interesting things about 18th century medicine, culture, the early days of American government…I love how books like this tie all those things together. 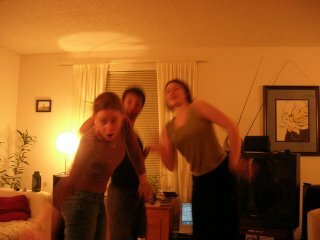 And lest you think my life is all dull and coughing and nonfiction, we had a dance party last night! Um, yeah. If you happened to be walking past our apartment last night and gazed through our open blinds, I hope you laughed. Really hard. 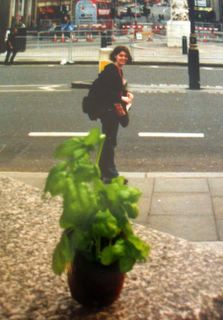 There was some talk of blackmail to try and get us to not put pictures on our blogs. Frankly, I’m just feeling too lazy to download pictures, but might if provoked. Speaking of blackmail, we’ve decided that the only reason our incredibly awkward landlord allows our crazy neighbor (the one that smokes in a non-smoking apartment, goes on ten quick car trips around the block an hour, and threatens to kill other neighbors) to continue to live here is that Crazy Neighbor (CN) is blackmailing Awkward Landlord (AL). They were, so the rumor goes, college roommates…and CN knows what AL did and is blackmailing him to get an apartment. It’s the only logical conclusion, right? Right? I’ve noticed that I like to make elaborate schedules for things. If I have a lot to do the next day, I might decide that I’ll get up at 8, give myself an hour to shower & eat, run X, Y, and Z errands by ten, do an hour of letter writing, go for a walk, etc. Have it all mapped out. Then of course I get up at 9 and around 12 I start thinking about running errands. I just found myself thinking, “maybe I should create a schedule for the type of books I read…one new children’s book, one nonfiction, one adult novel, one older children’s book…” Yeah right. I can’t keep to schedules like that. But, I did just finish an adult novel, a nonfiction, an older children’s book (well, two of them), and a new children’s book this week…Maybe I could, more or less, keep to a schedule like that. Oh, plus a book on tape at all times. I finished Criss Cross this morning, while I skip church in favor of hacking up my lungs in the privacy of my own home. I am still going to work, where neither incense nor singing doth prevail. 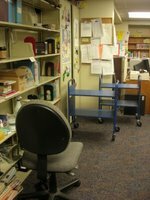 I snapped this picture yesterday – this is my “spot.” A more accurate picture would have one of those carts piled high with books and videos. 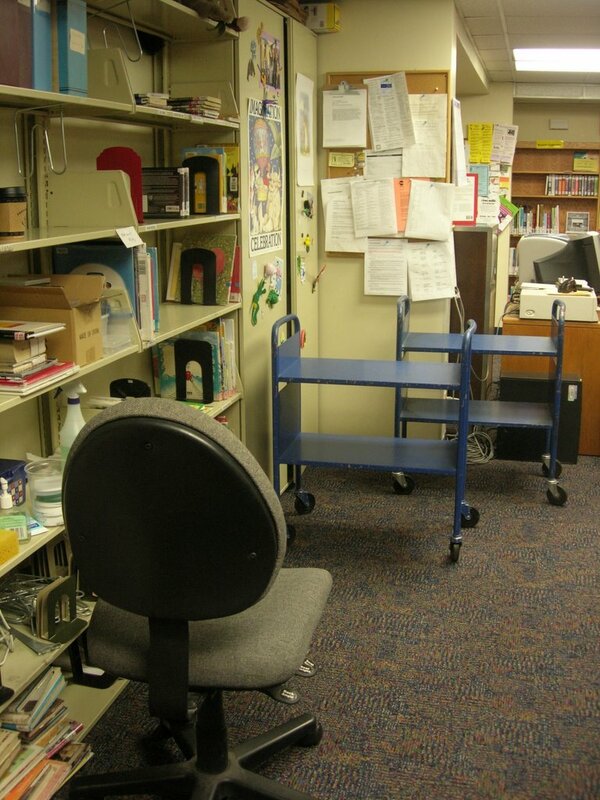 This is where I sit and sort through things and chat with whoever is sitting at the desk. There’s also a work table to the right where I cover books and such. 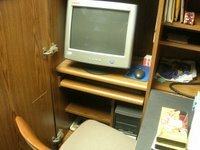 In the back corner is a lovely little cubby that I squeeze into when I work on the computer. 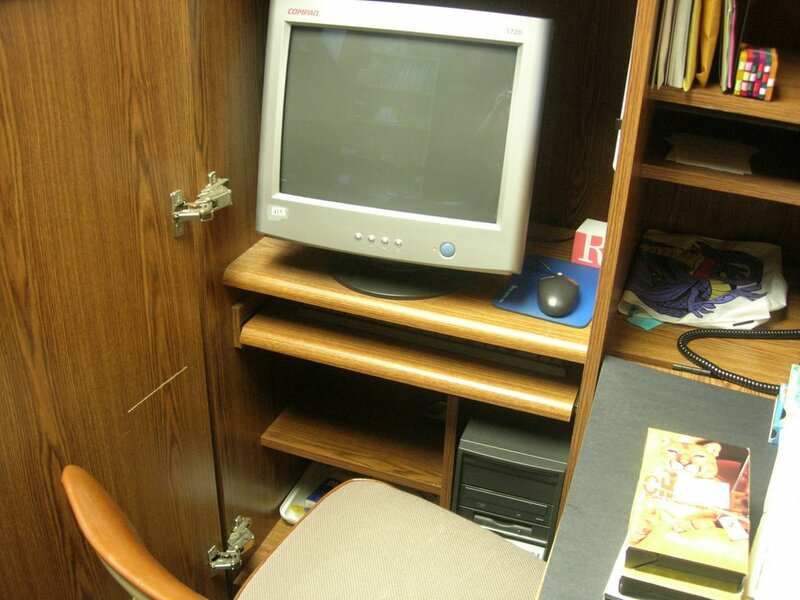 You have to pull the chair out, sit, and propel yourself forward to reach the keyboard, because the door on the left won’t open out any further, and there’s a fold-down table on the right. It’s a tight fit. My computer, oh my computer. 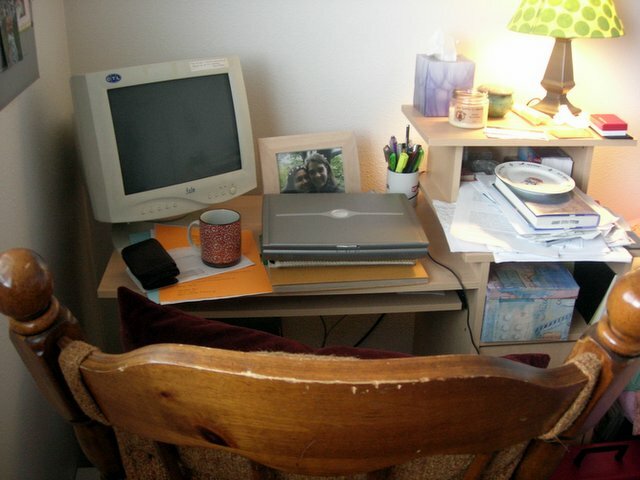 This is about as low as it gets around here – my breakfast dishes, stacks of unopened mail & unfiled papers, letters to reply to, old notebooks and scrapbooks stashed under the laptop…and oh yes, a desktop, too. To top it all off, I usually sit in a very ergonomically correct rocker, pulled up to my desk (which I assembled singlehandedly!) Someday I’ll get rid of that desktop, but not while it still holds everything I ever wrote in college. The laptop is a recent aquisition, bought from Kate when she switched to Macs. I just dropped by my parents’ (to return a disc of 24 episodes that my brother made for me – “illegally, of course,” in his words) to discover a strange state of affairs. First, my dad is in Costa Rica. Which I knew about, but the strangeness of it still strikes me. My pale, red-headed, easily burned father is fishing in Costa Rica. My three grown cousins invited him on their annual trip in lieu of their dad, my uncle, who died last year. My dad had to get a passport for the trip, his first ever. Good thing he started applying for one early, because he had a lot of trouble convincing the government that he exists. Or that he is who he says he is. There was some mix-up with his birth certificate not being official. He ended of having to get the only other surviving member of his generation or older, blood-related, to notarize something confirming his identity. Good thing he still had a living blood-relative, his aunt who’s twelve years older than him and relatively hardy, compared to the rest of the family (well, my great-grandmother lived into her 90s and lived at home till the end, but the rest have perished relatively early). Second, my mom, who had been looking forward to a nice quiet house while my dad was away (my brother, you could say, works at being neither seen nor heard, and my sister has a house with friends), was woken up at three the other morning. She heard some splashy noises in the bathroom, and figuring my brother would only be up if he were sick, she knocked on the door. Apparently she had stopped by, watched a movie, had a snack, and decided that a bath was in order. Why she couldn’t do all this at her house, I have no idea. I promised my mom that I would never show up at 3 am to take a bath. The guitarist on the stage, tuning his guitar, let pure drops of sound fall into the noisy room, making the pockets of quiet. The drops fell into the middle of conversations and hushed them. The drops of sound fell on an unmoistened sponge that was waiting somewhere inside Hector. In his heart or his mind or his soul. He didn’t realize that he was in a sponge state but, having been separated from his moorings – couch, TV, pizza – and led into unfamiliar territory, there was a spongy piece of him left open and receptive to the universe in whatever form it might take, and the form it took was a guitar. And then I stopped. It’s trying so hard and it ends up being so clunky. Reading the first chapter a second time, I can’t help but think, “If I were back in a fiction writing class, and this were someone’s short story, I would be groaning and trying really hard to think of nice things to say when I critiqued it. I’m so glad I bought that basil. The man behind me? A complete stranger. But I love this picture, especially amped up with some extra warmth. Now for some actual self portraits. 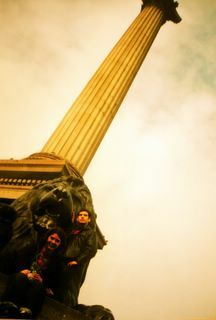 Although Bee has to take the actual picture-taking credit. 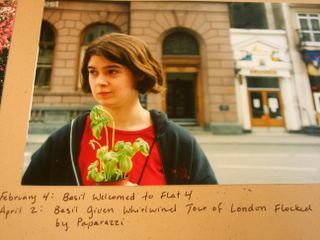 London 2002, with basil.